In the previous article, we discussed “Types of Underground Conduits”. Now we will proceed with our discussion on “Construction of Conduits”. Underground conduits can also be termed as buried conduits. They are constructed in variety of shapes with different materials used for construction. How to determine the strength of the conduit? 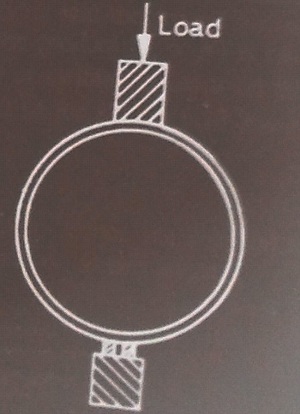 A three edge bearing test has to be conducted in order to determine the strength of the conduit. This test simulates a very severe loading condition which would rarely occur in the actual conduits. This helps us determine the maximum load the conduit can take. It has been seen that the conduits can take greater load than that obtained in the test. The factors affecting the load carrying capacity cannot be well defined. These conduits sometimes undergo failure due to excessive deflection. Rigid conduits fail due to rupture of the pipe wall.